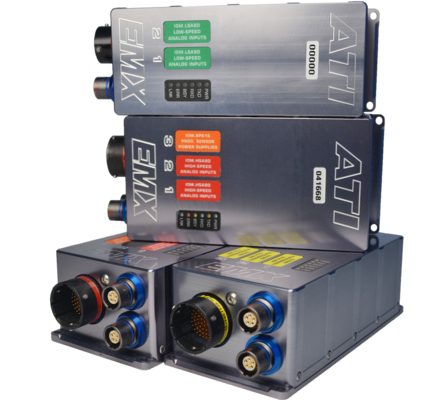 ATI’s EMX Data Acquisition units provide unprecedented levels of high end measurement and redefine the cost per channel equation, with unrivalled performance and reliability. Available in thermo, analogue or combined channel variants, EMX features compact, water-tight, IP67 rated, hard anodised billet aluminium housings and aerospace-grade Deutsch connectors. Innovative hardware architecture enables a wide range of EMX modules, exploiting the ability to combine analogue and digital channels in compact packages to suit individual project requirements. Frequently used to replace existing high cost rack-sized clusters of dedicated analogue and thermocouple units, EMX delivers significant cost and performance benefits. ATI’s DLX datalogger combines a CAN interface, data acquisition module and datalogger in one compact package. Data channels include CAN, K-Line, and LIN, enabling easy interface to ECUs or communication with ATI data acquisition hardware. ATI’s VISION Data Analyser enables easy viewing of DLX Datalogger data stored in ASAM MDF4 version 4.1 file format without requiring an additional software utility – a first in this segment.